Maan slowly opened his eyes rubbing it with the constant ringing of the alarm and wondered why Geet has not yet waken up. He looked down to see his beautiful wife sleeping peacefully on his chest. It has become a ritual to wake up daily like this in the past thirty five years. Otherwise he won’t let anyone in peace, as their grandson Dhruv says “dadu is mad for not having dadi near him, see papa how much he loves dadi. You always fight with mom. This is not fair.” Gautam, their son, always tries to shut his son’s mouth and ends up getting scolding and a long lecture from Geet on how to take care of his wife. He always wondered whether she is the same Geet who took every hurt and pain that he inflicted in her without any complaint, still does. She always made sure that their son, who had the same temper and arrogance like him, never hurts their daughter-in-law, Suhaana. Whenever he asked about that she told, “Not everyone will be able to survive with it.” She was right. No one can be like her. She is an angel, a gift from God to him. She is unique and will always remain. 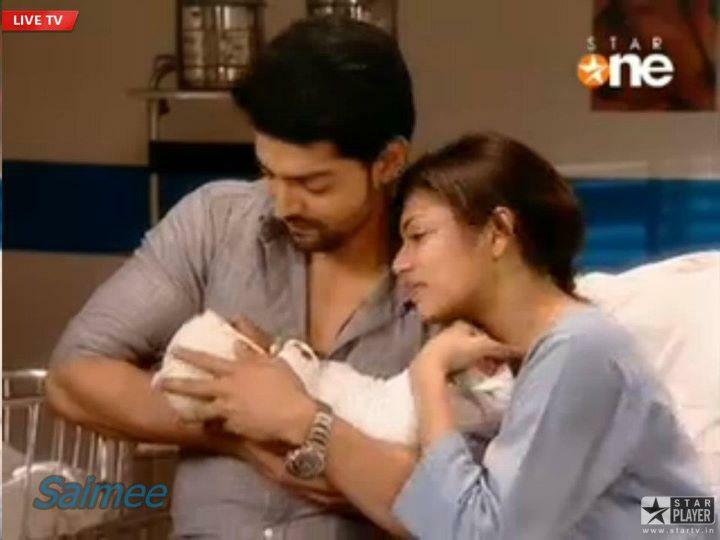 Megha, their daughter was almost like Geet, sweet and caring. She understands every need of others without mentioning it. Her husband, Raj was fortunately a very caring person unlike him and Gautam. He still remember how horrible was he and Gautam to Raj initially when Megha told that she loves him. Their hours of interrogation and Raj’s patience finally bear fruit and they are now happily married with two naughty little kids, Shreya and Samar. Their family was complete and they were now proud grandparents. He looked at Geet who was slowly opening her eyes. She smiled seeing him and wished Good Morning snuggling more into him. He asked, “Geet, tumne alarm 5.30 ko kyun rakka?” She smiled and told, “Takki aap kisi se gussa na ho aur mera kaam bhi tik se ho.” He knotted his eyebrows while she continued, “Agar mein aap se pehle utgayi tho aap sab ke upar chillayenge. Agar mujhe late hogaya tho Dhruv ka khana kaun banayega. Isliye alarm 5.30 ko set kiya takki dono kaam tik se hojaye.” He examined her for some time and pulled her to one long passionate kiss which left her breathless. She told, “Maan, kuch tho sharam karo. Now you are the grandpa of three children, still..” Maan closed her mouth and told, “Geet, tumne yeh bahut baar keh chuki hoon, jab humare bacche bade hogaye the, jab unki shaadi hui thi, aur jab unka baccha hogaya tha.. Par tumhe pata he ki chahe jitna bhi saal kyun na beet jaye mera tumhare liye jo pyaar he woh badtha hi jayega. I love you Geet.” She smiled hugging him close and told, “I love you Maan..” After a while Geet got up to freshen up while Maan went to Gym. Unlike old times, he had Gautam and Dhruv to accompany him in his tai-chi sessions. Geet went down and found Suhaana looking lost near the kitchen table. She was sure that Gautam and she had some fight yesterday. She tapped her shoulder and Suhaana immediately composed herself before turning back. Geet asked, “Kya baat he Suhaana?” Suhanna smiled and told, “Kuch bhi tho nahi ma.” Geet knew she was hiding something and told, “Beta, tumhe pata hena tumhare chehre se mujhe saaf saaf pata chaltha he ki kuch tho baat he.” Suhaana knew that there is no use of lying to her and immediately hugged her crying. She told between the sobs, “Ma, mein unhe surprise dena chahthi thi aur woh business ke kuch tensions ko leke mere upar chillaya. Mere surprise bhi kharab ki aur phir subah bina baat kiye Gym chala gaya.” Geet smiled knowing that their son is as stubborn as Maan and sometimes acts without thinking. She remembered how she planned to surprise him with the news of the baby and how it turned out to be. Geet pulled back from the hug and wiped her tears. She told, “Beta, I kind of know what your surprise will be. But don’t be disappointed. I know how stubborn the father-son duo is. Tumhe pata he, jab mujhe pata chala ki mein pregnant hoon mein bahut khush thi. Aur meine socha ki unke birthday ke din unko surprise doon. Poore ek hafte mein baby room sajane mein aur unke surprise plan karne mein lagi hui thi. Aur birthday ke din unhe humare ateet ke kuch incident ke baare mein pata chala jo mein usse nahi batana chahthi thi aur woh uss baat ko leke pareshan hogaya tha. Phir mujhe do mahine wait karna pada unko good news dene tak woh bhi unhe accidently pata chala kyunki mein behosh hogayi thi.” Suhaana smiled whole heartedly listening to her mom-in-law. Geet continued, “Mujhe nahi lagtha he ki mera beta utna khadoos he. Unka gussa jaldi tanda ho jayega.” Both laughed when until Maan who was standing near the door with Dhruv asked, “Geet, yeh khadoos kaun he?” Geet looked at him shocked and asked, “Aap kab aaye? Aur Gautam kaha he?” He smirked and told, “Jab tum mujhe khadoos bula rahi thi tabse mein yaha hoon. Aur Gautam room mein chala gaya. Suhaana beta, tumhe bula raha tha.” Suhaana muffled laughter and went to their room taking Dhruv from him. Geet turned and started doing something or the other to avoid the nervousness. Maan smiled seeing that. No matter how strong she is before others but before him she is always the old innocent Geet. Maan went near her who had her back towards him, almost touching her back with his hard chest. He whispered on her ear, “Geet, give my black coffee..” She immediately gave his black coffee she just prepared, without looking back. He took it in his hand and told, “Aaj hum office nahi jaa rahe hain.. Take our breakfast to our room after they left.” Geet looked at him surprised. He winked and left after placing a small peck on her lips. Even though Gautam took over the work, he refused to take up the post of MD or CEO of Khurana Constructions from his dad and mom. So they remained in the post just attending the meetings giving suggestions to Gautam. Meera and Dev had left for Canada after dadima passed away. Khurana Industries head office was also shifted to Canada. They were settled now with their aging life with their two sons and daughter-in-laws along with the two naughty little ones. Annie was married to Arjun after the first birthday of Geet and Maan’s twins, with Arjun Rathod and is settled in Mumbai with their children and grand children, so was Prem and Ayan settled in Delhi. They used to pay visits to Khurana Mansion occasionally. Geet smiled thinking of them. How fast time flies? She felt it was just yesterday that she had her twins, Gautam and Megha in her hand. Everything has changed except them and their love.. It has always been the same and will always remain. She smiled and asked Maria, their new cook, to serve the breakfast for Gautam and Suhaana while she took Dhruv’s plate and left to feed him. He never allows anyone other than her to feed him. After having breakfast, Gautam and Suhaana left along with Dhruv. Before leaving, Dhruv turned to her and told, “dadi, enjoy your day with dadu.. Koi disturbance nahi hoga..” Geet was left mouth open hearing him. He ran out before Geet could scold him followed by a grinning Gautam and Suhaana. Geet was all red and embarrassed. She went to kitchen and took their breakfast before giving a day off to the Maria and others. Maria told she will clean up the dishes and leave. Geet went to their room and noticed that he was in study. She went inside with the tray and noticed him waiting for her with his hands folded behind his head. His biceps were clearly visible and she couldn’t stop blushing at the sight even now. Maan smirked seeing it while she set the tray in the table. He pulled her to his lap and asked, “Hmm.. tho mein khadoos hoon. Pehle khana khalo uske baad mein tumhe dikha detha hoon ki mein kitna khadoos hoon.” Geet blushed like a new bride while taking the spoon full of pasta to his mouth. They finished the breakfast together with occasional kisses from Maan. She went and gave the tray to Maria after that. While she was back Maan was resting in their bed. She was tensed as to what is in his mind. Even after all these years she still gets tensed when he is near. She slowly went and sat near him. He pulled her into his arms and she hugged him tight. He told, “Geet, yakeen nahi hota he ki itne saal beet gaye. Lagtha he ki sub kuch kal hua tha.” Geet kissed on his chest and told, “Maan, woh isliye kyunki humari zindagi un sab lamhon se humesha jude ho… Un lamhon ke bina humari zindagi adhoori he… Hum har din un lamhon ko dubara jeene ki koshish kar rahe hain.” Maan smiled at her explanation and told, “Tho kyuna hum un palon ko dubara dohraye jab hum honeymoon pe gaye the.” She hit lightly on his chest and told, “Maan, aap bhi na, bahut besharam hogaye hain.” He pulled her from the hug and hovered over her. He told, “Tumse kaise sharam Geet, Aur ha mein khadoos ko bhula nahi.” With that he pulled her into a passionate kiss. Their love and passion only seems to increase every day. Soon they forgot the whole world around them, drowning into the ecstasy of the emotions. Maan vowed to never let her down; he won’t break the promise he made to be with her always. Even though the guilt was still there, he decided to let it go. Geet was also happy that he let it go but she knew that he won’t get rid of the guilt very soon. She didn’t want him to give importance to the incident. Slowly they both erased it from their memory. Their life was back to normal, the only difference being the increased intensity and passion in their love. Maan didn’t leave her even for a minute and took her to most of his business trips in the pretense of needing assistance. He was extremely careful with Geet and she was sometimes getting irritated with his concern. She was not allowed in Kitchen and always had to eat healthy food under Maan’s strict supervision. She had developed a liking to Italian food and she often complained that it is because of Maan that she lost her taste. He loved her tantrums and her cravings except sometimes when she woke up in the midnight asking for pickles or ice cream. Nakul had stocked a range of pickles and ice creams, but every day she craved for something new. In office, Maan slowly started involving Geet in making business decisions and made sure that she is present in most of the meetings with clients. His clients also were impressed with the young Mrs. Khurana who was simple and approachable unlike MSK. Maan was happy with the appreciation she received. By seventh month, she was given leave despite her complaints. She was at home full time under the care of dadima and Nakul. Rano and Mohinder used to visit her often. After Godhbharai, they wanted to take her home, but Maan was against it and they didn’t pressurize further as they knew it will be the best for her. Ayan and Preeti’s marriage took place after two months; Prem and Priya were expecting their baby and it added to the happiness. When Geet was eight months pregnant, Maan had a business trip to Vegas. He was supposed to be there for two weeks. He so much wanted Geet to accompany him but was denied by dadima. Geet too wanted to accompany him but was little apprehensive as she was nearing the due date. Maan was not planning to give up, he consulted with the doctor. She told that it is not recommended to travel by flight after seven months. But he assured that she will be taken care well and she approved as her due date was still one and half months away. After much persuasion, dadima agreed and they left for Vegas. Maan smiled and went on his knees. He kissed her belly and placed his ear on it. Baby kicked right then. He told, “Gudiya, dekho tumhari mummy abse tumhe yaad karne lagi he. Jab tum aayegi tab mera kya hoga?” Geet slowly ran her fingers through his hair. She asked, “See how he is kicking me. Mujhe lagtha bilkul aap jaise honge.” Maan stood up after placing a kiss on her tummy. He asked taking her in his arms, “Geet, tumhe zyaada takleef tho nahi ho rahi hena? Zyaada mar tho nahi rahe na?” She smiled seeing his care. After knowing that they were having twins, he was very much tensed. But she assured that she is fine but she knew that he won’t stop getting tensed. He carried her to bed and placed her there. After sometime he joined her after getting fresh. He ran his right hand over the cute baby bump. He felt the kick as soon as he placed his hand. He noticed from Geet’s face that she felt pain when the baby kicked. He slowly moved near her face and placed a kiss on her forehead. He asked, “Geet, dard ho raha he?” She looked into his eyes. She knew there is no use lying because he clearly knew when she was in pain. She smiled and told, “Thoda sa, par ab tik he. Dono bahar aakar apne papa se milne keliye bechain he. Isliye maar raha he mujhe.” Maan smiled and took her lips into a passionate kiss. Maan was really happy about her pregnancy as he got to know another side of his innocent wife. Sometimes Maan Singh Khurana was just a chooha in front of his sherni. After the two weeks in Vegas, they left to airport. Geet was not feeling good from the previous day and Maan was really tensed. He had asked assistance from one of their relatives who was a gynecologist and after checking Geet, she agreed to accompany them in the flight in case of any emergency. They had to take a flight toLondonand then connection flight toDelhi. The business class was having only four persons except them giving them much privacy. When the flight was half way toLondon, Geet started getting pain. Maan couldn’t have been more tensed ever than he was then. He clarified with the doctor almost a million times that Geet and babies are going to be fine. He regretted his decision to take her along but she assured that she wanted him to be with her this time more than anything else. The lady doctor and the staff made arrangements for delivery within the flight. All the passengers were eager when they heard about it. Maan was tensed seeing Geet in pain even though she bit back the sobs and pain for his sake. After four hours of labor, Geet gave birth to the twins, a baby boy and girl. Everyone congratulated the couple. Geet and Maan’s happiness knew no bounds. The tension was long forgotten after seeing their babies. When the flight landed inLondon, Maan made arrangements to get them admitted in a hospital for check-up with the help of Vikrant. He informed dadima and Rano about the good news. Both were exited as well as tensed for Geet. He asked Aadi to make arrangements for their tickets toLondonas he decided to stay back there for some days. Geet and babies were admitted in the hospital for a day. Others reached almost by evening and were happy seeing the twins and Geet. Geet slept almost rest of the day and night as she was very tired. Rano persuaded Maan to go to his apartment there and take rest. He agreed as he knew Geet may need her mother with her. He had arranged everything for Geet and babies in the apartment within the time he got. His Geet was coming there for the first time. Next day after discharging, Maan took them to his apartment. Maan was happy that this time, he is coming with his cute little family. Dadima welcomed them with aarti and they shared the sweets. Geet and Maan were not getting to hold the babies as others were taking them in turns. Finally all of them retired to sleep leaving the babies to them after much persuasion. They went to their room and Geet was awed seeing the arrangements he made in the short period of time. He asked her to get fresh as both babies were sleeping. When she came, Maan was holding their baby girl patting her to sleep. The other one woke up soon and started wailing. Geet couldn’t see him breaking down like that. She hugged him tight running her fingers on his hair. She told, “Maan, aap please sambhalo apne aap ko. Mein janthi hoon ki yeh sab itna aasaan nahi he aapkeliye. We are equally guilty for whatever happened. Please usse bhul jao. Humare bacche ki khatir. Please.” Maan composed himself slowly and got up. He hugged Geet and told, “Geet, aaj ke baad, mein koi bhi dard tumhare paas tak aane nahi doonga. I promise to make everything right. Par mujhe thoda waqt chahiye.” Geet pulled out from the hug and looked into his eyes and told, “Tik he. Aap jaisa chahthe he, waisa hi hoga. Mein humesha aapke saath hoon.” Maan thanked her and hugged her tight. She remained in his embrace but knew something has changed. She didn’t know whether everything will be fine as before. The rest of the day, Meera and Annie never left her side taking care of each and every need of hers. After dinner when she reached their room, Maan was sitting in their bed with laptop. She changed and lied down facing him. He looked at her and kept the laptop aside. He came near her and placed a soft peck on her forehead. He caressed her tummy and placed a kiss there. Geet smiled at his gesture. He told after sitting back with the laptop, “Geet, tum so jao. Mujhe thoda kaam he.” She was disappointed as she wanted to sleep in his arms, but just smiled and turned to the other side to sleep. Due to fatigue she slept soon. Next morning when she woke up, she was sure that Maan had not slept with her as she didn’t feel his presence near her in sleep and the side didn’t look like someone has slept. She went to get fresh and threw up a few times due to nausea. She was exhausted when she came out and noticed Maan entering the room. She knew that he was at Gym. He wished her Good Morning and left to take bath. She was again disappointed as he didn’t notice her tiredness. She thought may be she is expecting more. She went down to Kitchen. But as soon as she entered she had a tendency to throw up and Annie who woke up early noticed this and took her to the guest bedroom downstairs. She threw up few more times and was really tired. Annie asked her to take rest for a while there. Dadima and Meera came soon after hearing from Nakul. Meera and Annie were worried seeing Geet but dadima assured that it is common during pregnancy. Geet asked them not to tell anything to Maan as he may get tensed. They agreed and after a while she went up to get ready. She noticed that Maan is in study. She got ready after placing his dress and went downstairs. She waited for Maan and they left together to office after having breakfast. Even though Maan kept on asking her whether she was fine almost once in half an hour, she felt the warmth missing. She could feel the distance in their relation. Next few days went with the same routine. She was giving him time as she thought he will get over it soon, but he seemed distant than before. She missed sleeping in his arms; she missed his warmth when she needed it the most. She knew that he was hurting inside but that was hurting her more. Her morning sickness has worsened as days passed by. The tiredness and his indifference was taking a toll on her. Two months passed, with no change in Maan’s attitude. Maan was lost in his own private hell that he failed to understand the turmoil Geet was going through. He didn’t even muster the courage to speak to her as every time he looked into her eyes, it reminded him of the incident. He failed to notice her misery. She looked fine before others but he didn’t know she had reached the break point. Geet was at the verge of break down even though she tried to appear calm and composed. Maan’s love had started to lower the guard she had managed to put around herself. She had let herself susceptible to every pain and hurt. She took the hurt and showered happiness to everyone. Not once did she hurt anyone by her words. But the amount of love and care Maan bestowed over her in the small amount of time made her realize her importance in his life. Slowly she started feeling the need to be loved. Her heart started expecting from him, his love. She yearned for his love, it had become the reason she breathe. Seeing him drowning in guilt forced her to let down all the guards and she shouted at him for the first time in her life. She couldn’t let him down, they both were equally at fault and she had suffered enough. She can’t let it affect their life any more. The only thing that came in her mind to prevent Maan from the guilt trip was taking all the blame on herself and she did it. She knew that, she couldn’t have prevented him even if she resisted that night as he was stronger than her but she knew that he will never do something like that in his right state of mind. She wanted him to let go of that incident but she knew that he won’t come out of that so easily. When he distanced himself suddenly she couldn’t cope with it. She couldn’t let him go away from her. She wanted to scream at him not to leave but the old Geet in her prevented from doing so. But it was getting unbearable as days passed by. She felt her heart will explode with pain and she lost it completely when he told that he had a business trip coming up for two weeks. She looked at him with a blank expression and asked, “Maan, do you love me?” Maan was shocked hearing her and asked, “Geet, tum aise kyun pooch rahi ho?” Geet’s face and voice was stern and she repeated, “Answer me Maan, do you love me?” Maan noticed the seriousness in her voice and told, “I love you Geet, more than I have ever thought of loving anyone.” She asked without any change of expression, “Do you love our child?” Maan was bewildered hearing her questions and told, “Geet, how can I not love our child? It is our love, our treasure.” She continued, “Do you want to keep us both happy for the rest of the life or leave us?” He was shocked and immediately caught hold of her, “Geet, tum yeh kya bol rahi ho? Leave you, how can I even think of it? I want to give you all the happiness in this world.” She told still stiff and clear of any emotions, “Then forget about the incident as if it never happened.” Maan’s hands in her shoulder stilled and he slowly took his hands away and turned his back to her. She remained in the same position waiting for his answer. He told, “Geet, woh itna aasaan nahi he jaise tum soch rahi ho. I can never forgive myself for what I did. It was a mistake, a fault, a crime that I did to you. It will definitely take time for me to get over it.” He waited for sometime for Geet to respond. Hearing no response from Geet, he turned to see Geet was not there. He rushed out of the study and reached their room. He saw Geet packing her clothes in a bag. He went near her and held her hand. She looked at him with a blank expression. She took her hands from his and continued placing her clothes inside. Maan held her shoulders and shook her, “Geet, tum yeh kya kar rahi ho?” Geet didn’t reply and continued packing. He took the bag away and asked angrily, “Geet, mein tumse pooch rahi hoon. Tum kya kar rahi ho?” She looked into his eyes and told coldly, “Hum ja rahe hain. When you have got ridden from the guilt, we will come back.” Maan was taken aback by the coldness in her voice. He asked shocked by her behavior, “Geet, what happened to you? Why are you behaving like this? How can you think of leaving in this condition?” Geet’s control broke with the question. Maan was shocked after listening to her. All the while, in his grief, he never thought of how it will affect her. He failed to understand that she was his reflection, his pain, his grief, his happiness everything reflected on her. How could he think that he can hide his grief from her? He didn’t realize how much she has suffered till now and is still suffering. By distancing himself, he was putting her into the same grief that he was going through. Besides how could he forget about their love, their treasure that she is carrying? He again did the mistake of breaking her completely. She took her bag from him and started walking towards the door. Before she reached the door, Maan came out of the shock and rushed to close the door. She told, “Maan, please aap mere rashte se hatiye.” Maan shook his head and told, “Humara rasta kabhi alag nahi he Geet. Tho mujhe tumhari raste se hatne ki zaroorat nahi he.” Geet looked at his face and asked, “Aap kya chahthe hain? Mujhe kya kya aur sehna padega aapko wapas pane keliye?” Maan’s heart cried listening to her words. He took the bag from her hand and put it aside. He scooped her up in his arms and took her to their bed. He placed her on the bed and joined her, hugging her close. She didn’t protest now as she was tired of all these. He told hugging her, “Geet, I’m sorry. No words can compensate for the pain I gave you.” He turned towards her and placed kisses all over her face. She melted with his each kiss. He captured her lips into his, while his hands expertly got rid of their clothes. She was longing to be with him and the pregnancy hormones were adding to it. His hands moved towards her curves molding them, the tips perched up with his touch. His lips left hers and moved down further to her neck and collarbone placing luscious kisses all the way. He nipped her soft skin marking her again. He took her curves into his mouth sucking it hard. Her body was more sensitive due to pregnancy and her response was quick. She moved her hands on his bare upper body feeling his abs and muscles. She moaned his name louder as he moved his hands further down feeling the wetness. His hands pleasured her in the most unique ways while she quivered with the pleasure racking through the body. When he felt that she won’t be able to hold anymore, he entered her in a long thrust caring not to hurt her. He put his weight on his elbow while he thrust in and out of her. He flooded into her after some more powerful thrusts. When they lay exhausted in each other’s arms Geet told, “Please humse door mat jaiye. Hum jee nahi payenge.” Maan didn’t reply instead caught her lips into another passionate kiss. The moment she shouted, he knew that he is again putting her to misery. It is his fault and he is again making her suffer for no fault of hers. He knew she loved him beyond any limits. If he is getting hurt, she will feel the same pain. If he is happy, then it will be reflected in her face. She is an inseparable part of his life, his Saaya, in all the true sense. When she needed him the most, he left her alone to suffer everything alone just like he did in the past. He pulled her out of the hug and looked into her eyes which reflected only love, the unconditional love for him. What good he did to deserve her love? How can she take all these so easily? How could he even doubt her, her pure innocent love for him? He didn’t know when his eyes filled up and started flowing until she moved forward and kissed it away. He noticed the pain in her eyes seeing him like this. He can’t let her get hurt anymore. He may not be able to forgive himself ever but he can’t let her see him in pain. He has to hide it from her. But little did he know that she understands every single gesture of hers. Maan looked stunned at her with tears in his eyes listening to her. How could she take the entire fault on hers to make him feel good? How she justified every action of his taking the whole blame on her? How could someone be so pure, so innocent, and so unselfish? How could she love him so unconditionally? He couldn’t get any words to tell her. He pulled her to him and hugged her tight. He kissed her hair and mustered his courage to tell only this much, “I love you, Geet.” She hugged him tight pouring out the pain and hurt that she had been carrying on her heart since long. Her pain was too deep that he could feel her body racking with the sobs. He wanted to calm her down. He understood her pain now; he can’t let her suffer again. He knew she suffered a lot. Not anymore. He can’t let her. He pulled out from the hug and captured her lips into his to stop her sobs. She kissed him back with equal fervor. It spoke everything, the pain, the hurt, the love, the longing, the desire, the passion everything. He knew, she needed him and she knew that he needed her. They knew their existence didn’t mean anything without the other. They held onto each other like, if they leave for a second then the other may vanish. They broke the kiss when they heard someone clearing the throat. Geet looked down flushed while Maan turned to look back and noticed Aadi standing with the nurse, both embarrassed to have disturbed them. Aadi told stammering, “Wwwoh sirrr, discharggge kki forrrmalitiess hogaya.. Ab aaap dono ghhhar ja sakthe ho.” Maan nodded and turned to Geet who was about to get down from the bed. Maan caught her hand preventing her from getting down and she looked at him confused. He smiled and scooped her up in his arms. Her hands automatically went around his neck and placed her head on his shoulder. Aadi and nurse smiled seeing it. While Maan carried her outside, all looked at them in awe, who unknown to the attention they received where lost in each others eyes. He helped her to sit in the car and they left for KM all the while steeling glances at each other. When Maan entered KM with Geet in his arms, dadi and Annie rushed to them anxiously as Sasha informed Annie that Geet had fainted in office. Dadi held Geet’s hand and asked, “What happened Geet bte? Tum tho pehle do hafte se bahut nazuk lag rahi thi. Kya kaha doctor ne? Aur aap dono itne jaldi kyun wapas aagaye?” Maan told, “Dadima, dheere boliye. Aapki tabiyat bigad jayegi. Geet bilkul teek he.. Aur..” He paused and looked at Geet. She blushed and nodded him to continue. He continued, “Dadima, aap pardadi bannewali ho.” Dadi and Annie were delighted and hugged Geet. Soon Meera reached there, getting informed from Annie that Geet fainted in office. KM was in a festive mood and Ayan and Prem joined with their respective fiancee/wife, sooner. As Geet was surrounded by everyone, Maan decided to let her enjoy with them and left to their room. He changed and went to study closing the door behind him. He couldn’t hold the tears that he has been holding since long. Even though Geet justified him in every possible manner, how will it reduce his fault? How could he do that to her? Getting drunk is not an excuse as he always knew his limit and should have stopped by then. Even if he thought it was Sameera how could he force himself on her? He can never forgive himself for that. After their marriage also he never even acknowledged her, for not a fault of hers. She took everything came her way and never blamed him while he could never bring himself to trust her. She has always loved him and trusted him taking all the ignorance and mistrust without any complaints. Not once did she mention about the pain he inflicted in her, even after she got the assurance of his love. And even after he came to know about everything, she took the fault on herself. She never let him down even once. He can never forgive himself for what he did, but he will make sure that their life never gets affected by it. He won’t let her suffer anymore. She deserves happiness in her life and he will fill her life with only happiness and won’t let any evil shadow on her. He can’t show his hurt and pain to her as she will be the one who is pained more seeing it. His thought process was stopped when she knocked the door. He immediately composed himself and opened the door to face a concerned Geet. She was tensed since he left to their room. She wanted to follow him but she couldn’t leave everyone and go. So she finally made an excuse of leg pain and they immediately asked her to take rest. Meera offered to rub her feet but she told it will be fine once she rests and left to their room. When she saw the study closed, she panicked. She immediately knocked the door and Maan opened with a smile on his face. She asked, “Aap tik ho?” He smiled and told, “Geet, yeh mujhe tumse poochna chahiye, tum mujse nahi.” Geet told, “Par, aap wo baat ko leke pareshan the’” He didn’t let her complete and told, “Geet, ab humare zindagi mein woh sab koyi manya nahi rakhtha. Mein apne dard mein tumhari khushi ko ek baar kho chukka hoon. Dubara aisi galthi mein nahi karna chahtha hoon. Ab sirf hum aur humari khusiyaan, humara pyaar.” He held her closer and placed a hand on her stomach. She hugged him feeling light at heart. Even though she was not quite convinced with his change, she decided to let go off that now and deal with it at night. Now she had a surprise for him. When Geet tried to interrupt he put his finger on her lips and told, “Chup, Let me talk. I know the reason why I felt the familiarity in every touch of yours; I know the reason for the contentment I felt that morning. I know that it was me who destroyed the life of an 18 year old. I know it was me who crossed all the boundaries of sanity destroying all the morals and values dadima taught me. I know I’m the culprit, Geet. I know I am the one.” He fell on his knees before her not able to talk further with the outburst of the emotions. His heart was aching with pain and guilt. Geet immediately sat near him taking him in her embrace. No she can’t let him down; she can’t let him go through the guilt trip. She was ready to suffer any amount of pain, but not let him. She can’t let him suffer. She told, “Please aap meri baat suno. Isme aapki koi galathi nahi thi. Insaan jab hosh main nahi hota, tab woh jo bhi kartha he jaanke nahi kartha he. Jis baat ko aap yaad tak nahi kar pa raha he us baat par aapki galathi kaise ho saktha he?” He looked at her face hearing her words and asked, “How could you do this Geet? How could you justify me yet? How could you forgive me for what I did to you? How could you love me still? I don’t deserve your forgiveness nor your love.” He stood up removing her arms around him. Geet shook her head for a no. He told moving backward with each sentence he spoke, “No Geet. No punishment is enough for me for what I did. I can never forgive myself for what I did. I don’t deserve you Geet. I don’t.” He reached the door and left the room without waiting to hear what she has to tell. Geet broke down the moment he left the room. The day which was supposed to be the best day in their life turned out to be something she never imagined. She knew the moment he knows the truth, he won’t be able to forgive himself for what he did and he will break down completely. That was the reason why she kept all the pain to herself. She can’t let him suffer. She didn’t know what to do. She needs to get him out from this guilt trip. Only she can do that. When she came out of the room she saw Maan going out dressed up. She ran behind him and held his hand. He didn’t turn back or shook her hand away. She told, “Aap kaha jaa raha he. Mujhe aapse baat karni he. Aise kahi mat jao. Please.” He told without any emotions, “Nahi Geet, I need some time alone. I promise, I will return soon. Please give me sometime. I will talk to you after I come back. Please let me go.” Geet left his hand immediately after he told that. She felt on her knees, “Please let me go.” The words echoed in her ears. How can she let him go when he is the reason of her existence? Maan looked behind and on seeing her like that, he knelt down beside her and held her hand. He told in a low voice, “Please Geet, try to understand me. I need sometime before I could talk to you. Please.” She looked up and saw that he was not meeting her eyes. The damage is happened. Now she has to rectify it. She decided to give him sometime. Everything else can wait. She knew that he will come back to her. She will wait until then. She pressed his hand softly and told, “Maan, aap ja sakthe ho. Dadima ko inform karke jaana. She will be worried.” Maan nodded and left without glancing at her face. She heard him calling Nakul and asking him to bring his jeep keys and heard the sound of jeep leaving the premises very soon. She realized her position only when Nakul came worried calling her. She braced herself and stood up looking fine. He came and enquired regarding his sudden departure. He told that Maan will go for camping only when he is disturbed. She smiled and told, “Woh apne parents ko miss kar raha tha. Aaj shayad unka pehla birthday he unke jaane ke baad jab usne apna birthday celebrate kiya.” Nakul was not convinced but she assured that everything is fine and asked him to lock the next room until he returned back. She will not share the good news to anyone before he comes. She will definitely get him out of the guilt, the pain. She went to bed after changing and slowly caressed her tummy. She told, “Baby, dekha papa kitna hurt he. Lekin hum unko aise dard sehne nahi doonga. Hum unko yakeen dilayenge ki unhone kuch galat nahi kiya he.” She tried to catch sleep as she knew that she has to do it for their baby. But sleep was far away from her eyes. She couldn’t sleep knowing that her Maan was in pain. Meanwhile Maan was driving towards his normal camping area after informing Dev and Aadi. He reached there in four hours due to his rash driving. He took an axe and went to cut the trees. His mind was screaming to find a solace somewhere to get rid of the guilt where as heart was reminding him each and every gesture of her, his Geet. It brought immense pain thinking about what he had done. What if she might have got pregnant? How she could have survived? What if someone else saw her like that? How much shame it might have brought to her? How she might have suffered everything alone? Was it not enough that he destroyed her life that he married her striking a deal? The thought of how he behaved in the earlier days of marriage started to stab his heart. With every question, he let his whole energy in cutting through the trees. He wanted to exhaust himself of any energy. Once he was done with the trees, he took the metallic chain and started hitting himself with it. His body was sore very soon but the pain was nothing compared to what he was feeling inside. But what he didn’t know was that he was again giving her pain by being away from her like that. The next day dadima and Annie reached early morning as Dev had informed them about Maan’s camping. Dadima was worried but Geet convinced her with the same as what she told to Nakul. Even though Geet appeared calm outside, she was dying inside each second being away from him, being not able to share his pain, being not able to reduce the hurt. Even though she took care of the diet, the continuous nausea and the mental agony were taking a toll on her health. She waited patiently for him to return but was shocked when Annie told that he won’t be returning at least for a week. She couldn’t bear this distance. She tried his number which was coming out of coverage area. She didn’t know what to do. Next week she had to manage the office in his absence as well as take care of her health. She was getting weaker as days passed. It was Friday and one week since she met him. She wanted to know if he is ok. She wanted to wash of his guilt. She so badly wanted to be in his arms, in his care and the pregnancy was making her crave for his presence. She was walking towards his cabin to get a file of the new project when she felt her head spinning and her body giving up. Before she could hit the ground two strong arms held her and she fainted in his arms. Maan decided to go back when he felt that he could no longer keep away from her. He doesn’t deserve her love or forgiveness, but he has to apologize for his deeds. He can’t let her suffer for his fault again. When he reached KM, dadima came worried and asked about how he was? He was confused at first but later on he came to know about how well she handled the situation. When dadima told that she seems to be very weak and tired from past few days, he immediately got ready and left for office. It is his entire fault, he again made her suffer. When he reached office everything was going fine as Geet had managed everything properly. Aadi gave him the status and he moved towards his cabin when Aadi told that Geet will be there. He saw her near his cabin. She looked weak and fragile. He saw her swaying and immediately caught her before she could hit the ground. She had fainted in his arms. He immediately called driver and took her to hospital. He paced outside the room cursing himself for being so selfish again. After a while doctor called him to talk. She asked, “Mr. Khurana, how could you be so careless in this condition of hers?” Maan asked tensed, “What condition? What happened to her?” Doctor told, “Calm down. You should not stress her out. It is not good for your baby. She told that she consulted the doctor once. I am prescribing her some vitamin and folic acid tablets. Make sure that she takes it on time and is having sufficient rest. Let her rest for a while, and then you can take her home.” He sat there shocked. His Geet was pregnant with their baby and he left her when she needed him the most. He again failed her. He nodded to doctor’s suggestion and went to see Geet. That was it. She had enough. She pulled him to her by his shirt collar and told, “Bas Maan. Bahut hogaya. Aap akele kaise decide kiya ki mein kya chahthi hoon? Aapko pata bhi he ki mujhe kya chahiye. Meri poori zindagi mein dil se sirf ek cheez chaha he. Woh he sirf aapka pyar. Are you trying to deprive me of that? Are you trying to take away the reason I breathe? How could you be so selfish? Do I mean nothing to you? Does my happiness mean nothing to you? Bolo Maan. Bolo“, she asked shaking him. Maan held her hand and pulled her into his embrace before she could protest more. She went in smoothly to where she belonged, in his arms. Maan couldn’t move a bit after hearing it. He didn’t need any confirmation on whether it was him who did it. It was definitely him. The familiarity in her touch, the contentment he felt in the morning after that day, the ruffled bed sheets, and the red coloration in water while he took the shower everything explained him what he did. But he wanted to hear it from her, before his guilt overpowers him. The day which was supposed to be the best day in his life has turned out to be the worst. He went back to his cabin and tried to engross himself in work but nothing could help him today. He did a grave mistake to an angel, who knows nothing but to give love unconditionally. Nothing can rectify his mistake. He defamed the values and morals his dadima inflicted on him. He did the worse to a girl, who was just 18. How much has she suffered, just because of him? He held his head in both his hands and sat with his head bowed. When he heard a knock in the door, he immediately composed himself. Geet came inside smiling. She looked at him and noticed that he is disturbed. She asked, “Kya baat he? Aap bahut der se pareshan lag rahe ho?” He looked up, her each and every caring words were hitting him like nails. He was not worth it. He told keeping the coldness in his voice, “Geet, hum ab office mein he. Tum kaam karlo.” Geet was little disturbed by his sternness but smiled and told, “Ok Maan sir. Can you please give my mobile back?” He gave the mobile back without any change of emotions in his face. Geet told before leaving, “Aap jaldi ghar aa jaiyega. Mein panch baje nikalthi hoon.” Maan just nodded and she left the cabin confused. Geet went back to her cabin and noticed that the blinds were closed. Something is definitely wrong. She decided that her surprise will definitely change his mood and left for home soon. Dadima, Annie, Dev and Meera had left for the farmhouse Maan gifted to Dev as they wanted to give the couple privacy for the day. They knew that Geet has some surprise in her sleeve. Geet reached KM and decorated the baby’s room with balloons and candles. This is going to be a surprise for him. After preparing his favorite dishes, she waited for him. She asked everyone else to leave and told she will take care of everything. She checked the time; it was half past nine but he didn’t reach yet. She was worried. She called to his mobile, it was coming switched off. She called Aadi and he told that he left early from office. She was really tired after the preparations and dozed off due to tiredness in the table itself. When Maan came by almost midnight he noticed that the lights were on and saw Geet sleeping in the chair. He saw the dishes in the table. He understood that she dozed off waiting for him. Again he is hurting her, but he doesn’t deserve her love and care. But for today he needs to talk to her. He went near her and slightly shook her. She opened her drowsy eyes and asked, “Aap aagaye. Mein kabse wait kar rahi thi. Sab log farmhouse chale gaye. Aap fresh hoke aao. Mein khana lagathi hoon.” Maan told, “I had dinner, Geet. Tum khakar upar aao. Mujhe tumse kuch baat karni he.” Geet was disappointed but couldn’t show it to him as she didn’t want him to feel bad on his special day. She smiled and told, “Tik he, Aap jake fresh hojao.” Maan left feeling his chest getting congested with pain for making her disappointed. She decided to go up without having dinner but the thought of baby prevented her from doing so. She had dinner and cleaned the plates. She smiled remembering the surprise and went up. The next few days went with their occasional arguments and romance. Both were very much relaxed and work was progressing well. Maan was totally at ease and seldom blasted at the employees. Preeti had handed over the tasks to Geet soon as she was a quick learner. It took only few days for her to familiarize with the tasks. All the employees liked Geet for her friendly and down-to-earth nature. They have always thought that Maan Singh Khurana’s wife will be more sophisticated but she was simple and bubbly, always ready to help. She never allowed anyone to address her as Ma’am, not even the trainees. They were really fond of her. She had selected one trainee to work under her, Megha. She was very much helpful to her and Maan also liked her as she seldom drooled over him like others and was good at work. Sasha had mellowed down after the incident and had decided to move forward taking in Geet’s advice. Geet was really happy when Munshiji came to KM to invite them for Sasha’s engagement. She went to talk to Sasha and Sasha apologized for her deeds. Everything was going well and for Geet, her life appeared to be a fairy tale. But everything was the calm before the storm. The Saturday after Preeti left, Geet had arranged a lunch treat for her ex-colleagues and Preeti. Ayan was also invited along with Dev, Meera, Prem and Priya. As Maan was going to sign a deal to Manali for the project Geet had done analysis, he couldn’t join them. They had a great time during the treat and Ayan got some time to spend with Preeti before their marriage. Geet was feeling nauseous even after having all her favorite dishes. She was feeling tired from the past few weeks and had missed her periods, which she didn’t consider seriously. After the treat, she went back to KM along with Dev and Meera. She went to their room and rested for a while. When she woke up she felt like her head spinning and had a tendency to throw up. She immediately went to washroom and almost puked everything she ate. She was very tired by then. She asked Nakul to bring some warm water to drink and told him that she is going to rest for a while. Dadi and Meera came to enquire about her health and she told may be indigestion. They asked her to sleep well and she assured them that she is fine as they had to go to a relative’s engagement in the evening. Dadi insisted Geet to take rest and there is no need for her to come. Geet agreed as she was very much tired. By the time she woke up, others had left, leaving her a note to take care and Maan had called to inform that he will return only the next day. She really needed Maan to be there but she knows that the deal was important. She thought of the reasons for her nausea and remembered that she missed her periods. Her heart made a jump, “Is it possible that I’m.. I’m pregnant?? Babaji, let it be true. I need to confirm.” She called a gynecologist whom she knew since long and fixed her appointment in the evening. She got ready and told Nakul that she was going out to buy some gifts. Nakul insisted on going by car and called the driver. She also thought it to be best in her current condition. She went and did the check-up. When the doctor confirmed her pregnancy, her happiness knew no bounds. She is carrying Maan’s child, their child, their love; the thought itself gave her Goosebumps. She decided to surprise him as his birthday was on next Friday. She decided to make it special. She has to keep the news from others till then. First she needs to get ready to surprise him. She asked driver to take her to baby shop and she bought everything required to arrange for a baby room. She smiled thinking of Maan’s reaction to this. She went home after getting some more gifts for Maan. After reaching KM, she had to tell Nakul as she knew she can’t do anything without his help. Nakul was really happy and immediately went on talking about her diet. He helped in arranging the room next to them for the baby. She decided to get the painting done some other day as she knew others will be returning soon. It was almost 9.30 by the time they finished arranging the room. She had dinner and left to their room. She called Maan and talked for a while. He was missing her as much as she missed him. Others reached very late and Geet had slept by then. Nakul kept mum at her insistence. Maan returned almost by evening next day. He noticed that Geet was looking tired. When he inquired to Meera, she told about the treat and they concluded it to be some sort of food poisoning. He insisted her to take leave next day and rest. Geet was more than happy to oblige as she knew she can decorate the room after painting as no one will be home. Maan noticed that beyond the tiredness there was an unusual glow in her face. He asked, “Geet, kya baat he? Tum different lag rahi ho.” Geet bit her lip and thought, “Hey babaji, kahi mein zyaada obvious tho nahi lag rahi he. Mujhe unhe surprise dena he. Control Geet, control.” She told, “Kuch nahi, aap wapas jo aagaya he. I was missing you.” Maan smiled and told, “I missed you too Geet.” He pulled her to him and kissed her passionately. Geet pulled back after a while feeling short of breath. Maan asked smirking, “Itni jaldi saase ruk gayi.” Geet hugged him and placed her head on his chest. Maan told patting her head, “So jao Geet, tum bahut tired lag rahi hoon.” If any other day Geet would have objected, but she knew that she needs to take care of the little one. She hugged him and slept peacefully in his arms. Maan too slept hugging her close. Next day, Geet with the help of Nakul and other servants, painted the room and arranged the room. Dadima was out for her NGO work, so she was very much relieved. Once the room was done she thought, “Maan, aap humesha mujhe surprise dethe the. Ab meri baari he.. I know you will love the surprise.” Maan was quite busy with some new clients and reached home very late. Geet would have slept by then. Next few days were busy for both. Maan with his deals and Geet with her tasks plus Sameera had returned from her extended trip. She was finalizing the project with Sameera. She was happy to see that Geet joined KC and she had noticed their occasional romance and eye-locks as she will be most of the time in Geet’s cabin. She knew that they were so much in love that reflected in all their gestures. Finally it was Thursday evening. Geet went home early and baked a cake for him. She told dadima that she wants to surprise Maan and dadima agreed to her. They managed to make the arrangements on time. Dev managed to keep Maan busy with some of the discussions of KI and they both reached home by almost 11.55. When they entered the whole KM was dark. Maan told, “Dev, I think they all slept. But why Nakul didn’t leave any of the lights on.” Dev told, “Bro, you wait here. I will check and come.” He waited for sometime and suddenly lights came. He was surprised to see the decorations before him and saw everyone wishing him Happy Birthday. Then only he remembered that it was his birthday. Dadima came forward and hugged him, giving him her wishes. Then Dev and Annie wished him. Aadi, Sasha and Pinky were there too. Ayan and Meera wished him afterwards. His eyes searched for his Geet. There she was in a red saree, looking gorgeous holding the cake. She placed it in the table and went near him. She hugged him and wished him Happy Birthday. He knew it is her arrangement and smiled. He cut the cake and took one piece. Geet gestured towards dadima. He gave dadima, Annie and Dev. He took one piece and held it near her mouth. When she opened her mouth, he smeared it all over her face. She looked at him annoyed and others laughed seeing her face. She went to wash her face while Nakul cut the cake and gave to others. She came back soon and others left wishing him. Dadima, Annie and Dev also retired for bed soon. Maan looked at Geet who was not meeting his gaze. When he walked towards her, she immediately left with Nakul to kitchen. He knew she was annoyed and now he has a hard task in hand. He sighed and went to room. He changed into his vest and tracks and went to bed. He saw her entering after a while and directly went to bathroom taking her clothes without sparing a glance at him. She changed to her night dress and lied down on the other end turning her back to him. Maan slowly went near her and held his hand around her waist pulling her closer. She closed her eyes not to give in so easily. She tried to take his hands from her waist but he held her tighter. He nuzzled her ear and placed a kiss on the nape of her neck. She shuddered at his touch but composed herself immediately. He asked placing a kiss on her ear, “Geet, tum mera birthday ke din hi mujse naraz ho? Kya mujhe itna haqk nahi he ki apne patni ke saath thoda hassi-mazak karu?” That did the task of manofying. She immediately turned back placing her hand on his mouth. She told, “Aap please aisa mat kaho. Aapko mujpar pura haqk he.” Maan smiled at her innocence. He knows that she will never let him down. He pulled her to a hug and kissed her forehead. He told, “Mujhe bahut acha laga Geet. I have celebrated my birthday first time after my parents passed away.” Geet hugged him and told, “Mujhe pata he. Woh dono aaj aapko dekhkar bahut khush honge.” Maan placed a light kiss on her lips and told, “Sab tumhari wajhe se he Geet.” Before she could tell something he captured her lips into a passionate kiss. After pulling back he asked, “Geet, par mera gift kaha he?” Geet smiled and told, “Gift tho aapko kal raat hi milega. Wohi aapka saza he.” He smiled and told, “When I have the most precious gift of God with me, what more I did?” Geet told, “Hmm, Mujhe yakeen he aapko mera gift sabse precious lagega.” Maan raised his eyebrows and told, “Tho mujhe uska intezaar rahega. Par ab keliye let me enjoy my gift” and pulled her into another kiss. Soon both were panting in each others arms after their love making. Maan was very careful as she appeared fragile from past few weeks. That was definitely good for Geet as she can’t tell him yet about their baby. They slept soon in each others arms. Aaj lunch humare saath. Will wait for you. Maan smiled and looked through the blinds and saw her laughing with Sameera in her cabin. He checked the time, it was 12.30. He decided to spend his afternoon with Geet and was about to leave when Pinky informed that Mr. Abhishek is there to meet him. He was from the private detective firm he had asked to get the details of Geet. He asked her to send him in. He closed the blinds as he didn’t want Geet to know about it. The facts Abhishek presented was very much confusing. He mentioned that Geet never had any relation even friendship with guys except Ayan. In school, no one dared to come near her as Brij was a terror to who ever tried to even talk to her. That he also knew from Prem. In college, Ayan was very much protective about her and nobody made any move towards her. While in hostel, she never came late except for the Farewell day when she was in first year. After that she was always with Meera or Ayan as she was staying with them. Maan thanked Abhishek and he left. Maan couldn’t see where this must have occurred. He so wanted to know the one who did it to his innocent Geet. Putting two and two together, he concluded that it might have happened in the farewell party, as Ayan had mentioned about her worse condition the next day. Then it had to be someone either in his batch or hers. He needs to find it out. He decided to keep it aside as he knew she was waiting for him. Sameera had left by then and Geet was waiting for him. He went near her and hugged her after closing the blinds. He kissed her passionately as his mind was disturbed with the information. Geet could feel his tension and asked him after pulling back from the kiss, “Kya hua? Aap tensed kyun ho?” Maan told, “Kuch nahi Geet. Chalo hum chalthe hain.” Geet smiled and decided to ask it later. They left for lunch. Geet had reserved a table in Maan’s favorite Italian Restaurant. Maan was awed at her surprises. He was little apprehensive as he knew Geet hated Italian dishes. But to his surprise, she ate the dishes as if they are the tastier dishes she ever had. He had noticed lately that she was reluctant to have her favorite Punjabi dishes. He smiled and asked, “Geet, tum aur Italian khana? Yeh kaisa chamatkar hogaya.” Geet pouted and told, “Kaise nahi hoga. Yeh sab aapki wajhe se hua he. Mujhe ab mera Punjabi khana acha nahi lagtha.” Maan shook his head and laughed while both continued to finish the lunch. They reached office by two. Sameera was waiting in Geet’s cabin and Maan left for his. When he was about to sit, he noticed Geet’s mobile in his hand which she gave to keep when she went to restroom. He took it and went towards Geet’s cabin. He was about to go inside when he heard Sameera talking. Sameera asked, “Geet, mein tumse kuch poochna chahthi thi. Us din party mein hi batane wali thi par tab Meera ka call aaya tha.” Geet told, “Ha bolo Sam.” Sameera continued, “Geet, tumhe woh farewell party yaad he jo humare jaane se pehle hua tha.” Geet’s face fell hearing it but she immediately composed it and told, “Ha yaad he Sam.” Maan could see her face through the small opening of the door. The changed expressions definitely caught his sight. Sameera told, “Us din mein Vivek se milne gayi thi. Kuch der baad Ayan ke call aaya tha. He told Maan was too drunk and I felt bad to have left like that. When I returned, I saw Maan leaving towards a private room. I was about to talk to him when I saw you coming out. Maan had pulled you inside and closed the door before I could talk. I waited outside for some more time but neither of you came out. Soon I got a call from Vivek and I left. Us din kuch hua tha? I mean did Maan get angry with you.” Geet couldn’t believe what she heard. She had always thought that only she knows about that night. Now she has to clear this out of Sam’s mind. Geet smiled and told, “Sam, woh mujhe tum samjke andar lake darwaza band kiya. He blasted after that on why you left so early. He was very angry. I was really tensed seeing him like that. Finally he passed out in the bed after a series of shouting. I came out after making sure that he is fine.” Sam sighed and told, “Oh my God, I was always worried as to whether he mishandled you that day. But you relieved me now. Leave it. Let us finish work soon. I know you have to prepare for the next surprise for Maan.” But outside the door, Maan stood getting the worst surprise of his life, the realization that he did it to her. Geet smiled through her tears and told, “Aapko sorry bolne ki koyi zaroorat nahi he. Mujhe pata he aapko kaisa laga hoga jab aap ne mujse shaadi ki thi. Apna pehla pyaar na milne ke saath saath aapko ek aise insaan se shaadi karna pada jisse aap pyaar nahi karthe the. I know the pain when the one whom you love won’t return it back. I can understand the pain you might have suffered due to the betrayal. It is normal that you lost trust over people. Aapke jagah aur koi bhi ho woh yeh sab hone ke baad, itni aasaani se kisi par viswas nahi karega. Mujhe aapse koi shikayat nahi he. Aapne jo kiya sahi kiya. Please don’t feel sorry about it.” Maan smiled hearing her. He knew she won’t let him down whatever he may do. But there was a pain too deep in her that he failed to understand. A pain she suffered all alone, a pain she couldn’t share to anyone. He hugged her close and both stayed in each other’s arms for a while until dadima called then for dinner. Next two weeks went fast for both of us. Geet had handed over her responsibilities to Raj and Rohan. Maan had few major deals to be signed and had occasional one day visits outsideDelhi. He informed Aadi and Sasha about the appointment of Geet and instructed Preeti to help her with everything once she joined. Preeti and Aadi were glad at the news and Sasha was fuming at the thought of Geet joining KC. She decided to make her life difficult. But little did she know what she is awaiting her. Friday night Geet returned late after the treat her team gave her. Maan was home before she reached and had retired to their room after dinner. She reached their room and saw that Maan was not there. She understood that he will be in study seeing the lights. She freshened up and went inside. He was working with his laptop and was talking on phone regarding some legal formalities holding some papers. She went and sat near him in the couch. He gave a smile and finished the call. She asked holding his arm, “Busy ho?” Maan smiled and told, “Nahi Geet, bus thoda sa kaam tha. Mein thodi der mein aatha hoon. Tum jao.” Geet nodded and went back to their room. She was confused as to why he thought so. She asked, “Aapko aisa kyun laga? Mujhe aapke saath kaam karne mein problem kyun honge? Ayan se..” Before she could continue, he told, “Nahi Geet, mein Ayan ke baare mein baat nahi kar raha tha. I was just asking about your wish. Tum khush ho?” Geet hugged him and told, “Maan, mein kaise khush na ho jab mujhe aapke saath poore din rehne ka mauka mila he. It’s true that I take decisions on my profession based on my needs and commitment. Aur yeh decision bhi meine soch samjkar hi liya he. Par mein bahut khush hoon ki mein aapke saath kaam karne wali hoon.” Maan smiled and kissed her forehead. He hugged her tight and told, “Thanks Geet.” Geet pulled away from his hug suddenly and sat up in the bed not knowing that the comforter slipped to her waist giving a good view to her husband. Maan was taken aback by her sudden withdrawal and looked up. The one look was enough for him to get aroused. She looked innocent and cute, yet desirable. He looked at her face and saw that she was annoyed. He asked controlling his desires, “Kya baat he Geet, gussa kyun ho?” She pouted and looked away. How was he to control when she looked so cute. He sat up and moved near her. He held her from back and kissed her bare shoulder. His hands moved upto reach her curves. Then only she realized her position and immediately turned around to hug him. Maan smiled and asked, “Kya hua Geet, ab sharma kyun rahi ho?” Geet shook his head buring her head in his shoulder. The softness of her skin on his bare chest was tempting him to start over again. He asked placing kisses on her neck and shoulder, “Geet, tum naraz kyun thi?” Geet pulled back hearing that when she was reminded that she was annoyed. She told, “Meine aapse pehle bhi bola tha ki mujhe sorry aur thanks mat kaho. Par aap tho Maan Singh Khurana he. Kisike baat kyun sunenge?” Maan laughed hearing her complaining cutely. He pulled her towards him and kissed her, making her forgetting the complaints while his hands moved over her curves before they proceed to make love. Finally it was Monday, Geet’s first day in KC. Both were really happy about the fact that they are going to be together full day. Geet got ready in a green salwar suit. She placed the dress for Maan and a note. Maan came after shower expecting her to be there, but found his dress and a neatly folded paper near it. Aaj mujhe jaldi office jana he. Woh kya hena, aaj mere naye office mein pehla din he aur suna he ki boss bahut khadoos he. Tho mujhe unse pehle waha pahunchna he. Kal se hum saath mein jayenge. Maan smiled reading the letter. He thought smirking, khadoos, wifey you will have to pay for it. He wanted them to leave together, but she may not get time for the formalities once he is there in the office. He dressed up and went for breakfast. After a small teasing session from Annie and dadima, he left for KC. Geet wanted to go with Maan, but she knew that she won’t get time for formalities or to talk with anyone if she reaches along with Maan. So she kept a note when he went to shower and left for office. She reached KC by 8.30. Aadi and Preeti were already there. They helped her with the formalities and Preeti showed her cabin which was next to Maan’s, the same cabin where she worked for Mr. Chopra’s project. Her cabin was arranged with all the necessities and she smiled seeing Maan’s care. She didn’t want to be treated different from others. But she knows that Maan will have his own explanations for that and she can’t win over him. She sat on her chair and started checking the files Aadi and Preeti gave her, regarding her tasks. She heard the siren buzzing and understood that Maan has come. She used to wonder on how terrified people were about him when she worked there for a while. May be the real terror begins now. She smiled and got back to reading the files. Meanwhile Maan came to his cabin and looked through the blinds. He saw her engrossed in the files. He smiled and thought, “So wifey started first day without seeing the khadoos boss. How can that be possible? ?” He smirked and picked the phone. Geet was startled hearing the ring of the phone. She answered the call. From the other end she heard, “Geet, come to my cabin, now.” She was left mouth open. She thought, “No hello, No hai.. Just come to my cabin.. Such main khadoos he, dusht danav..” Maan observed her gestures and knew that she was talking to babaji. He told, “Geet, ab tum babaji se baat karna band ki he tho jaldi mere cabin mein aao.” Geet looked up and saw him smirking. She told, “Yes sir” and put the phone down annoyed. Sasha told, “Geet, you are crossing your limits.” Geet told, “Sasha, I know my limits. If you feel like telling the facts means going beyond limits, then I can’t help crossing it. I don’t know if you believe what I’m going to tell. But let me clarify you something. You know that I was in love with Maan since IIT. But I never tried to force my love on him. I was contented with the fact that he is happy. It doesn’t matter if Sam was the reason for his happiness. And in my family, every decision is taken by elders, so was my marriage. I have no role in it. After marriage also, I have never forced him to love me. Do you think that someone can force Maan Singh Khurana to do something? No.. He always does what he feels right and never makes decisions on impulse. If you ask Sam, she will also tell the same. And as you told once, I am really lucky to have him as my husband. Not because of his power and money, but because of his love which is the best gift I could ever get in my life. I told all these to you not because I want to justify my actions but because I want you to move forward in your life. You deserve to be happy in your life and this obsession is only going to destroy your happiness. If you are still not convinced, ask your heart whether you love Maan. If it is no, then don’t hesitate to move forward and if it is an yes, then don’t hesitate to confess it.” She held Sasha’s hand and told, “Give your life a chance to be happy. Please do it at least for your dear ones. I have to go to meet Maan. Think over it” and left her cabin. Sasha even though annoyed couldn’t ignore the concern and care in her words. Even after the insults she hurled over her, she still cared for her. She left her cabin soon. Unknown to both of them, someone else had heard the whole conversation from outside. Maan saw the file that Geet left and decided to go to her cabin to give his wifey a peace of mind. When he reached the door, he heard Sasha speaking. He fumed listening to her, “How dare she insult Geet like that?” But when Geet started talking he waited to listen to her reply. He assumed that this is not the first time Sasha is insulting her from Geet’s talks. He felt proud of her after listening to her reply. Something that surprised him was even though she answered boldly at first, beyond all the insults she hurled on her, she still cared for her happiness. How could someone be so unselfish like her? Not once did she try to use the power of Mrs. Maan Singh Khurana. Well it is his task to show Sasha her place now. Before Geet saw him, he went back to his cabin. He purposefully hid the file, before Geet enter his cabin. He asked seeing her searching for the file, “Geet, meine tumhe bulaya nahi. Tum yaha kya kar rahi ho? Kahi aisa tho nahi ki tum apne pati se door nahi reh pathi.” Geet glared at him and told, “Mein aapko dekhne nahi aayi hoon. Mein woh file yaha rakhke gayi thi. Usse doondne aayi he.” Maan asked in an angry tone, “Geet, tum itna irresponsible kaise ho sakthi hoon? Meine tumhe ek important file diya aur tum usse sambhal nahi payi.” Geet was tensed now and told, “Woh, sorry Maan, mein.. I will search for it.. Mein sirf apne cabin tak gayi thi. I am sure it will be somewhere here” and started searching. Maan noticed that she was busy searching. He went near the door and closed it. He closed the blinds and called Preeti to tell everyone not to disturb him for a while. Maan went near Geet and hugged her from back. She was startled and turned around to see him smirking. When she was about to ask something, he told, “Tho tumhara boss khadoos he, aur kya bola tha dusht danav.. Hmm.. Nice names.. Par don’t you think that you deserve a punishment for that.” Before Geet could protest, he captured her lips into his in a scorching kiss. He was aggressive and passionate. She forgot everything when she felt his lips in hers. He left her lips, removing her dupatta, placing kisses along her jawline, moving further down to her neck and shoulders. He bit her ear and licked the sensitive spot behind it. His hands moved further down her back. She held his hand when she felt him opening the dori. She slightly pulled back and told, “Maan, hum office mein he.” Maan told smiling while removing her hand and continuing where he stopped, “Geet, mujhe pata he. Don’t worry about it. Uska intezaam mein kar chuka hoon.” Geet couldn’t think about anything further. He stopped after a while knowing that he won’t be able to control. He pulled away from her panting hard and told, “Geet, kya tum ab samjhi tumhare boss kitne khadoos he.” Geet looked into his eyes not able to comprehend anything he was telling due to the sensations he evoked in her body. He smiled and took the file from under the table. He took her hand and placed it there. He told smirking, “Aaj keliye maaf kiya. But don’t expect this favor always or else you will really get to see your khadoos dusht danav boss.” Geet was stunned hearing him. She shot him one annoyed look and left taking the file. Maan smiled when she exited his cabin. This is definitely going to be a test on his self-control. He has to definitely make some arrangements for this. He went back to work when Sasha’s words came back to him. He called Sasha to meet him in his cabin. He closed the blinds so that Geet can’t see their talk. Sasha came soon hearing the coldness in his voice. She asked after getting seated, “MK, you called me. Is there any new project coming up? Do..” Before she could continue Maan cut off in the middle. He told, “Sasha, I called you here to give one last and final warning. I have seen you misbehaving with other employees and had warned you many times. Just because you have the privilege of being Munshiji’s daughter doesn’t mean that you are free to do anything in KC. Today I heard your talk in Geet’s cabin. Let me remind you that Geet is Mrs. Maan Singh Khurana and 40% share holder of the KC. She will be assisting me in business and not just with KC’s projects. And I have employed her as an architect just because she won’t take up the post of CEO. She will never agree for something unless she feels she deserves it, unlike you people who think that there is no one beyond you. As you told, she can never take your place because she is far more capable than the post of a chief architect. Even if I asked her to join as a trainee, she could have readily agreed. I’m warning you, if you repeat this once more then I won’t think before terminating you from KC.” Sasha was really afraid after listening to Maan. She shot a quick apology and left telling that she won’t repeat it. All of them were exhausted when they reached Delhi. As it was Sunday they got plenty of time to rest. Dadi and Annie had returned early as Annie’s classes were about to start next week. They thanked dadi for gifting such a wonderful honeymoon. Next week was hectic for Maan and Geet as lot of work was pending due to the leave. Maan mostly reached late at night and Geet would have slept by then after a tiring day with work and study. Only mornings they could get to be together that too for a very short while. They missed each other’s presence badly. Ayan and Preeti’s engagement was fixed for the weekend and Meera dragged Geet along with her for the preparations. After the whole two weeks of togetherness, Maan was feeling restless by not having her near. He got totally frustrated. Besides as Preeti had taken leave for engagement, his meetings, schedules, files, everything was in a mess with Tasha handling it. He blasted at almost everyone in office and people were even afraid to be in his near vicinity. Maan lost his temper as Tasha had messed up his meetings, the files, everything. He knew that Preeti has plans for higher studies and will be leaving KC anytime. He needed someone efficient who can manage his tasks as well as helping him with the projects, more like a partner in the business. He knew exactly who can fill the post, his beloved wife, Geet. But he was doubtful about how to convince her. He decided to offer her the post of architect as the first step. He reached home and was informed that Geet and Meera were out for shopping. Nakul served dinner and he left for their room. He took his laptop and worked for a while. He was not sure about what Geet’s reaction will be. He has to convince her to take up the offer. For the first time in his life, MSK was afraid of rejection. Maan’s thoughts were broken when a tired Geet entered the room. He went near her and she hugged him feeling tired. No words were required between them to know what they need. He pulled out of the hug and kissed her forehead. He went to washroom and filled the tub with warm water. When he came out Geet was removing her earrings. He went near her and got rid of the rest of the clothes and removed his. He carried her to the tub and closed the door behind. After relaxing in the tub for sometime in each others arms, they had a shower together. He wrapped her with a bath towel that reached upto her mid thighs and covered himself with another one. He carried her to the bed and joined her there. He threw both the towels away and hugged her covering both of them with the comforter. She rested on him making patterns on his bare chest. Maan held her hand feeling aroused with slight touch. He told in a husky voice, “Geet, tum tired ho. So jao.” Geet looked up and shook her head. She told, “I missed you, Maan” He smiled hearing his name and turned her on her back. He pulled her into a passionate kiss. After sometime, he pulled away and told, “I missed you too, Geet” She placed her hand on his cheeks and moved forward to place a kiss on his lips. He held her by her hair and asked, “Geet, do you want this now? You are tired.” Geet smiled and told assuring him, “I’m no longer tired Maan.” Maan slammed his lips into hers before they both drifted off to a new world of sensations, pleasing each other. Maan was slow and careful not to hurt her. Geet was overwhelmed by his care that was felt in every single touch of his. She hugged him when he collapsed on her. He rested his head on her chest while both tried to get the breathing normal. He lied on his back and pulled her to him. She moved near to him, hugging him close. He told after a while, “Geet, mujhe tumse kuch zaroori baath karni he.” She looked up and saw the seriousness in his face. She told, “Aap ko kabse mujhe permission lene ka aadat lag gaya he?” Maan smiled and pulled her closer if it was possible. He told, “Geet, before I ask, let me tell you that whatever I’m going to ask, I need you to take a decision based on what you need. Don’t feel biased over anything else.” Geet nodded thinking about the possibilities of what he could ask. He continued, “This is not the right place to talk about it. Come to study at 9, tomorrow morning before Meera drag you for the preparations.” Geet was confused and asked, “Aap mujhe abhi bata sakthe hena? Kal tak wait kyun karna he?” Maan smiled at her restlessness and told, “Geet, what I wanted to discuss is not something that we can talk while in each other’s arms, devoid of clothes, after making love. I will take advantage of this situation if I talk about it now. I don’t want to do it.” She blushed at his choice of words and hugged him still wondering about what he had to talk. Her thought process halted when Maan pulled her into another passionate kiss and proceeding to repeat what they did a while ago. Next morning Maan waited impatiently for her in the study after drafting the offer letter. He was not sure how she is going to take it, but he has to try. She reached there wearing a pink salwar suit after helping Nakul to sort the dishes after breakfast. Maan gestured her to sit in the chair opposite to him unlike most of the times when they shared the couch. She understood there is something more serious about the matter he is about to discuss. She looked at him who was intently reading the file in his hand. He told after a while, “Geet, I am offering you the post of Architect in KC.” Geet was shocked beyond her wits. She expected anything but this. It took almost 10 minutes for her to recover from the shock. Apart from being Maan’s wife, she had always wanted to join the best construction firm and she knew KC is the best. She had felt bad when Maan refused to let her join KC. But now when he had come up with the offer, she didn’t know what to tell. She can’t think of leaving Malhotra’s, as she liked working there and has got so used with the friendly atmosphere there. Also she can’t refuse the chance to be with Maan 24/7. But professionally, it will be the best offer she could get. Malhotra’s have good projects, but not the best as KC have. Also working under MSK will be one of the best things that can happen to her career as she knew how focused he is and working under him, she will be able to learn a lot. But there is a person that she can’t ignore, Ayan, she can’t break his trust. She can’t take a decision without discussing with him. He gave her the job of architect without any guarantee or even an interview, he trusted her with one of the biggest projects, he supported her in every step she took in her career after she joined Malhotra’s. She can’t forget it. She looked up and saw Maan staring at her intently. Maan watched Geet as she was deep engrossed in her thoughts. He was sure that she won’t take any abrupt decision. But still he wanted to know what she felt about the offer. When she looked up Maan saw the firmness in her eyes and knew that she has decided what she should do. She spoke, “Maan, Thanks for the offer. Considering my career, I would be more than willing to join KC. But there are some facts that I could never ignore. I have a commitment to Ayan who employed me without any guarantee, who trusted my work inspite of being new in this field and supported me in my success and failure. I won’t take a decision without discussing with him. If he is willing to relieve me, then I will join KC.” Her words had an immense effect on Maan. His respect for her increased ten-fold. Anyone in her place could have readily agreed to his offer. But she even after being his wife was not willing to accept it. He knew she is fiercely loyal to people who trust her. He smiled and stood up. Geet was little apprehensive about how he will take her reply. When she saw him coming near she stood up. He came near her and pulled her into his embrace. He kissed her forehead and told, “I’m proud of you.” That was enough for Geet to know what he felt. She hugged him tight feeling relieved. Maan slowly pulled back after a while and asked, “So now that my wifey denied me the chance to be with her 24/7, let me not waste my time.” He scooped her up and walked to the bed. He placed her on the bed and joined beside her. Geet held his hand and told, “Aap kya kar rahe ho? Mujhe Meera ke saath bahar jaana he.” Maan checked the time and told, “Don’t worry sweetheart. We still have time left. Waise bhi we haven’t slept here since long.” Before she could protest Maan pulled her to a kiss. Soon both forget about everything else as they drowned in the sensations coursing through their bodies. When she got up after an hour wrapping her dupatta around her, she blushed seeing the clothes scattered through out the room. She felt a tug on her dupatta and turned to see Maan holding it. She told, “Chodiye na. Meera aati hogi. Mujhe ready hona he.” Maan smiled and pulled her along with the dupatta to himself. She fell on his chest and he wrapped his arms around her. He told, “Meine tumhe jaane ka permission nahi diya he” and pulled her to another passionate kiss. They broke apart after a while due to lack of breathe. Maan stood up and carried her to the bathroom. Both had another round of love making there and he left Geet to get ready after that. Geet was tired after their morning session and went down after getting ready. Dadima and Meera noticed the tiredness in her eyes. Meera told, “Geet, tum bahut tired lag rahi ho. Tum thoda aaram karlo. Mein aur Annie jaake bakki saara kaam khatam karlenge. Shyam ko hume waise bhi bhai ke yaha jaana he.” Geet told, “Nahi Meera, Mein tik hoon.” Dadima supported Meera and told, “Nahi Geet bte, tumhe rest lena chahiye.” Annie joined them by then listening to their talks. She looked at Geet and asked, “Bhabhi, kahi bhai aapko zyaada pareshan tho nahi kar rahe ho?” Geet blushed while Dadima smacked Annie’s head and told, “Chup badmash.” Annie told holding her head, “Dadima, dheere. Mera sir pathar se nahi bani he.” She turned to Geet and continued, “Aur haan bhabhi, aap jaake aaram karo. Kal ka din bahut busy honewala he.” Geet had to agree to them finally and returned to their room. She saw Maan grinning seeing her coming back. She went near him and told, “Aap has rahe ho. Aapki wajhe se mein unke saath jaa nahi payi.” Maan smiled and scooped her up in his arms. He carried her to the bed and placed her there. He pulled the comforter over her and told, “So jao, Geet.” He kissed her forehead and went back to study. Geet was expecting him to start where he finished when he carried her to the bed. But when he kissed her forehead and left she was confused at first. She understood that he wanted to stop her from going with Meera. He knew she will get tired and she needed rest after the tiring weekend. She smiled and snuggled to the comforter. As she was really tired, she fell asleep soon. Maan had to leave as Ayan needed his help and he couldn’t have denied him. Before leaving he instructed dadima and Nakul not to call Geet until she wakes up herself. When Maan returned almost by two, she was still asleep. Maan understood how tired she must be and he himself was not letting her rest. He changed and joined her on the bed. She snuggled closer to him feeling him even in deep sleep. They slept for a while before Geet got up. Her movements disturbed Maan’s sleep and he woke up. Geet looked at the time and was shocked, she started her usually self-talk without knowing that Maan is awake. “Dekhna babaji. Mein kitni lazy hogayi hoon. Kitne der se sorahi he. Aur inhone mujhe bulaya tak nahi. Pata nahi lunch kiya hoga ki nahi. Meera aur Annie abhi tak tho aagaye honge. Mujhe jaake dekhna chahiye.” Before she could get out of the bed, Maan pulled her to him. Geet was startled by the sudden pull and looked at him only to find him smiling. He told, “Geet, your babaji will be happy as he didn’t have to bother about your self-talks from past few hours.” Geet opened her mouth to retort back but turned her head pouting. Maan hugged her from back and told, “Geet, kabhi kabhi insaan ko rest lena chahiye. Tum waise bhi apna khayal nahi rakthi ho. Humesha doosron ke baare mein hi sochthi ho.” Geet smiled and held his hands. She told resting her back on him, “Aap hena mere khayal rakhne ko.” She blushed and closed her eyes once the words left her mouth, when she felt his hands tighten on her waist. Maan placed a kiss on her shoulder and told, “Kya baat he Mrs. Khurana. Itna viswas, apne pati par.” Geet told, “Haan’ Khud se bhi zyaada.” Maan smiled and told, “I’m sure he won’t break your trust.” Geet smiled and closed her eyes while he planted kisses on her neck and shoulders. After a while both left to join others. They had a light lunch together and others joined them too. They left to Malhotra Mansion by late evening. The next whole day has been busy for both Geet and Maan. Maan was helping Ayan while Geet and Meera were busy making arrangements for the engagement. It was kept simple as Preeti and her parents didn’t prefer much attention. Only close family and friends were invited. Preeti’s parents were really happy as Malhotra’s were down-to-earth despite the status and wealth they possessed. They felt lucky to have Ayan as their son-in-law. Geet made them feel home by her constant chatter along with Meera. They left to KM almost by late night. Monday morning, they woke up little late as both were tired. Maan skipped his morning exercise and Geet didn’t go to prepare breakfast. Before they left for office, Maan reminded Geet about talking to Ayan which she had forgotten all the while. She was tensed again thinking of how to present the matter. Maan had mentioned about his offer to Ayan. Ayan knew it from long time and asked him to convince Geet. Maan had purposefully left the talk they had as he wanted Geet to deal it herself. Geet sighed and told, “Ayan, jab mujhe job ki zaroorat thi tab aapne mujhe bina kisi guarantee ke, bina kisi interview ke naukri diya tha. You trusted me with one of the biggest projects when I just joined here as a junior architect. You never questioned me when my design was rejected for the Chopra’s project in fact you inspired me to do better. No one else could have done all those things for me. If you didn’t give that opportunity then nobody could have recognized my efficiency. So for me your decision matters more than anything else in this case.” Ayan was amazed by her reply. He stood up and went near her. He held her hand and told, “Choti, tumhe in sab cheezon keliye itna tension lene ki koyi zaroorat nahi he. First of all, I employed you because you deserved it. An interview was not required for me to know how capable you are. And for the project, I was sure that you will definitely give the best. But I don’t understand why you feel obliged? kya ek bhai apne behan keliye itna bhi nahi kar saktha. If you feel so then I will think that you don’t consider me as your brother.” Geet immediately told, “Nahi bhai, aisa nahi he. But I want you to take a final decision on this. Please. Won’t you do it for your sister?” Ayan smiled and told, “Choti, even though I don’t wish you to leave Malhotra’s, as a brother I want my sister to get the best and KC is the best in construction industry. So I want you to join there. But you will have to help our creative team when you have enough time once you complete your MBA course.” Geet was overwhelmed by his reply. She told hugging him, “Thanks bhai. You are the best.” Ayan held his invisible collar and told, “I know, I know.” Geet giggled and shook her head. Meera who was a silent spectator of their talk had tears in her eyes seeing the bond they shared. She knew how much Geet missed the affection of a brother. She was happy that she got it through her brother. Even though she was sad that Geet had to leave Malhotra’s, she felt elated that her friend is getting the best. The creative team was sad when Ayan disclosed the news. But they were happy for her as she will be joining MSK full time and it was really good for her career. Ayan decided that she can be relieved in two weeks time. Geet left for home feeling contented. Meanwhile Maan had a rough day as he was tensed about what will be Geet’s decision and Preeti had resigned as she was planning to continue her studies after marriage and had decided to take a break till then. In one month he had to find an efficient secretary if Geet is not taking up the offer. His temper was on top and he fired two employees for their minute mistakes. Everyone was afraid to even go near him. He decided he had enough of the day and returned to KM by 6 surprising dadi. She understood his foul mood and asked Nakul to give his black coffee. He even got angry with Nakul. When Geet came home Nakul informed her about his temper. She was tensed as to what had happened. Dadima told that Aadi informed that he literally set the office on fire after Preeti gave her resignation. Geet understood the reason for his anger. She went to their room and noticed that he is in study. She freshened up and went to study. He was in the couch with his laptop. The lines of tension in his forehead confirmed, how agitated he was. She slowly went near him and sat beside him. He looked up and told, “Geet, mein thoda busy hoon. Tum jao.” Geet smiled hearing him and stood up. But instead of going out she moved the laptop from his lap and placed it in the table. He asked getting angry, “Geet, tum kya kar rahi ho?” She went near him and sat on his lap circling her arms around his neck. He was about to protest when she moved forward and took his lips into hers. All his protests died in his throat when he felt her lips on his. Soon he took the charge and kissed her with equal passion. He picked her up and carried to the bed. Soon he forgot the tensions drowning in the pleasure of their togetherness. Geet was resting on his chest while he held her closer. She asked placing a soft kiss on his shoulder, “Ab tension kam hua?” Maan checked her face and moved over her. He told nuzzling her neck, “Not until I get your reply.” Geet sighed and told, “Tik he, chalo mein fresh hoke neeche chalthi hoon. Aap bhi aayiye. Hum dinner ke baad baat karenge.” Maan didn’t reply. He turned on his back and let her go. She looked at him and found his eyes closed. She stood up covering herself with the sheet and went to freshen up. She left to help Nakul with the dinner. Maan joined her at the time of dinner. Dinner was a quite affair except for the few talks with dadi. Meera and Dev were supposed to have dinner outside and Annie had retired to bed. When Geet went to their room after dinner, Maan was in the study waiting near the table. She went and sat in the chair just like when he offered the job. Maan asked, “So I guess you have decided.” Geet told, “Yes. I have made my final decision on this job offer.” Maan looked at her intently willing her to continue. She told, “I accept this offer. I can join KC after two weeks as I have to hand over my responsibilities there.” Maan’s heart made a jump hearing it. But keeping his composure he told, “It’s alight Geet. You can take your time.” He continued, “Preeti has resigned. You will have two more weeks after you join to learn the tasks from her.” Geet smiled and nodded. Maan wanted to ask regarding her talk with Ayan but decided otherwise. He took the drafted offer letter and gave her. He told, “Read it and sign if you are ok with the terms and conditions.” Geet read the whole offer letter taking it from him and signed it after reading the whole 10 pages carefully. He gave a duplicate and asked her to sign and give to Aadi when she joins KC. She took it and went to their room to keep it along with her documents. When she came back, Maan was relaxing in the couch with his eyes closed. His face was calm and serene. She sat near him and asked, “Aapko neend nahi aa rahi he?” Maan opened his eyes and pulled her into his embrace. He told, “Nahi Geet, aaj mein bahut khush hoon. Jo galthi meine pehle ki thi usse sudharne ka mauka aaj tumne mujhe diya he.” Geet tried to interrupt him but he stopped her and told, “Geet, aaj mujhe bolne do. Tum beech mein kuch nahi bolegi.” Geet nodded and waited for him to continue. Maan felt bad after she left. He tried to concentrate on work but his mind kept wandering towards her. Meanwhile Geet reached the beach and went to sit in one of the beach chairs covered by a big white umbrella. She felt bad to have spoiled his day. She thought of what she can do to make it up. Just then the lady came with fresh juice for her. She smiled and talked to her for a while. The lady was surprised by her calm and friendly nature as ever since she started working there no one had spoken to her like that. Everyone will be just interested in commanding and will ignore them afterwards. Geet asked after a while, “Kya aapko pata he ki yaha swimsuits kaha milthi he?” She told that it is available in the Hotel’s store and she will get it if she needed. Geet asked her to bring some decent looking ones. The lady came after a while with a packet of swimsuits and Geet thanked her for the help after paying for it. She told her not to let anyone in until evening and she smiled understanding her. Geet went inside and the next task was little tedious. She had to hide it from Maan. But when she reached he was near the pool talking over his phone and she quickly went inside before he noticed. She went to the other bedroom and closed it. She opened the packet and gulped seeing the swimsuits. Even though they were not much revealing, they sure will be hugging her body. She selected one black swim suit with short sleeves that covered her whole body upto her knees. She changed and went near the mirror. Even though it covered her whole body, it accentuated the curves and she looked desirable. She shied away looking at her reflection. She covered herself with a bath robe and went near Maan. He was back to work after finishing the call. Maan changed to his swim shorts in record time and went near her. Before she could comprehend, she was in his arms and he carried her to the beach. She wrapped her arms around him and looked at him lovingly. He put her down near the beach and both went towards the water. Maan pulled her close and hugged her. They both went further towards the sea. When water was upto their chest level Maan pulled her closer and whispered in her ear, “Geet, thanks for this surprise.” Geet smiled and told, “Anything for you..” Maan pulled her into a passionate kiss while they together took a dip in water. They came up without breaking the kiss. Maan’s hands wandered through out her body feeling every curve of hers while hers roamed over his bare chest and abs. After pulling out from the kiss, they swam for a while before Maan pulled her again to another passionate kiss. He took her in his arms and walked towards the beach. He placed her in the wet sand and went above her. She was looking more desirable in the wet swimsuit hugging her body. He placed kisses all over her face and moved down kissing her neck and shoulders through the open collar. His hands captured her curves from above the cloth while he sucked and bit her neck and shoulders. He moved down and kissed her curves from above the dress. He moved down and lifted the top a little before placing a sensuous kiss on her bare waist. She held his hair tight while his lips worked throughout her body. When he thought he can’t hold back further, he carried her to the open shower and cleaned up, all the while showering kisses all over her. He picked her up and went inside the bed room before kicking the door shut. He didn’t wait to reach the bed and ripped away the clothes from her body. He freed himself from his clothes and joined her on bed. His kisses were rough and demanding than usual. She knew how much he was holding on from morning and hugged him tight. Soon she forgot everything, moaning his name aloud as he covered her body with kisses and bites. He entered her in a long thrust and pounded on her. She didn’t feel any amount of pain as she was too lost in the pleasure and sensations coursing all over her body. They continued until the lady called informing about their dinner. Maan pulled her close and hugged her. He knew that she was exhausted and he was a bit aggressive. But he couldn’t control seeing her in the swimsuit and he had been controlling his urge to be with her since morning. She was hugging him with her eyes closed. He placed a kiss on her forehead. She opened her eyes and smiled. He asked, “Geet, I was little aggressive today. I’m so’” before he could tell sorry she closed his mouth with her palm. She told, “Aapko sorry bolne ki koi zaroorat nahi he. Mujhe nahi laga ki aap aggressive tha. Aap mujhe kabhi hurt nahi kar saktha.” Maan took her palm and kissed it. He asked, “Geet, tum itni achi kyun ho?” Geet smiled and told, “Aap mera tareef karna band karo aur jaldi se ready ho jao. Dinner abhi aayenge.” Maan smiled knowing that she won’t let the conversation go further. They changed to the early dress and went to the table. The lady had set the table with dishes and left. They had dinner feeding each other. After dinner, they went near the poolside. Maan sat in the beach chair near by and pulled her to his lap. She placed her hands around his neck and hugged him. Maan relaxed to the chair pulling her along. They stayed like that for a while enjoying the feel in each others arms. Geet raised her head and looked at him. Her eyes were teary and she hugged him tight again. She told, “I’m sorry.” Maan smiled and told, “Geet, tumhe sorry bolne ki koyi zaroorat nahi he. Mujhe pata he tum jealous feel horahi thi aur yeh sab samaj nahi payegi.” Geet got angry listening to him. She told, “Mein kisi se jealous nahi tha. Aur agar tha tho aap unke saath kya kar rahe the? Aur aapne mujhe buddu kaha. Chalo mein aapse baat nahi karengi” and stood up to leave. Maan pulled her back and she fell on him. He told caressing her face with his finger, “Yeh hui na baat. Meri sherni wapas jo aagayi.” Geet smiled hearing him and hit him lightly on his chest. Maan hugged her and pulled her to lie down. They went to sleep on the poolside bed watching the stars in each others embrace. Next day both woke up early. After breakfast, Maan told, “Geet, wear the dress I kept in the other bed room.” Geet smiled and went to check it. It was a one piece sleeveless swimsuit that will reach just above her knees. After dressing up she felt like covering herself with something when she found a short coat along with that dress. She wore it and felt comfortable after that. When she went outside Maan had already changed to his swim vests and shorts. He saw her coming and liked the way the dress fitted her. He went near her and opened the coat to get a full view of her. She shied away when he removed the coat. He pulled her close to a deep passionate kiss while his hands roamed all over her body. He pulled away from the kiss when he felt that he won’t be able to stop there. He smiled seeing her flushed face and kissed her forehead. He told, “Coat pehnne ki zaroorat nahi he. Sirf mein aur tum honge.” He wrapped his arm around her waist and they walked towards the beach. A small boat was there near the beach. She looked around to see if someone is there. Maan told, “Geet, meine bola tha na sirf hum dono honge.” Geet smiled and walked along. They got inside the boat and Maan started it. They went little further in the sea and entered a lagoon. They moved further and reached a place that looked like an island. Maan asked her to wear the coat and she saw a man coming towards them. Geet asked, “Maan, hum kya karne jaa rahe he?” Maan smiled and told, “Snorkeling.. Mein yeh sab sirf tumhare saath karna chahtha tha par Prem ne ek din tho pehle se hi kharab kar diya.” She knew he must have planned this earlier and smiled. The man came near them with a bag in his hand. He took out the snorkel and swimfins and made them wear. He explained how to do it and the safety measures. Maan told, “Thank you. You can take leave now. I will call you if I require assistance.” The man smiled and left. Once he was out of sight, Maan held Geet closer and removed her coat. She hugged him feeling shy. Maan smiled and told, “Geet, yaha pe koi nahi he. Sharmane ki koi zaroorat nahi he.” Geet smiled and pulled back from the hug. Maan held her hand and asked, “Ready, Mrs. Khurana.” Geet smiled and told, “Yes, Mr. Khurana.” They went near the place the man instructed to dive. They dived together holding their hands. Geet was afraid at first and had closed her eyes but when she opened it she was amazed seeing the view. They spend almost half of the day there enjoying the underwater view and of course sharing some romantic and passionate moments. They went back to hotel and had lunch. Both were tired and slept off soon. They woke up by late evening and spend rest of the time making love. They spend the rest of the days with occasional candlelight dinners by the beach, exploring some beautiful places and mostly making love. They didn’t know how days passed by and when it was time to leave for Delhi.